European Jewish leader slams 'deeply troubling' comments by Margot Wallström linking Paris attack, Palestinian 'frustration' with Israel. The President of the European Jewish Congress (EJC) has sharply condemned "deeply troubling" comments by Sweden's foreign minister, in which she appeared to link ISIS's attacks on Paris with "Palestinian frustration" with Israel, branding her statement "borderline racist." EJC President Dr. Moshe Kantor, whose organization represents Jewish communities throughout Europe, castigated Foreign Minister Margot Wallström for inexplicably turning the horrific attacks, which killed 129 people, into an opportunity to criticize Israel. "Radical Muslims massacred civilians enjoying a night out in Paris and Foreign Minister Wallström tried to make it about the Jewish State," Dr. Kantor said. "She has completely ignored the remarks made by those behind the attacks, Islamic State organization, almost as if depriving them of any agency for their reactions. This is a deeply troubling worldview and borderline racist." He further accused Wallström of ignoring "the tens of conflicts around the world involving Muslims and cherry-picks the only conflict involving Jews, as if to once again suggest, perhaps not consciously, the age old idea that the Jews are always central to international affairs in a malevolent way, and behind every event the hand of Jews can be found." In an interview with Swedish TV following the November 13 attacks, Sweden's foreign minister posited that "To counteract the radicalization we must go back to the situation such as the one in the Middle East of which not the least the Palestinians see that there is no future: we must either accept a desperate situation or resort to violence." Kantor added that such comments represented not just an offensive obsession with Israel, but also a real danger for European states who continue to ignore the real root-causes of Islamist terrorism. "The problem is not so much that the Israel is once again blamed for events that it played absolutely no role in, the larger issue is that if some in the West continuously ignore the true motivations behind these terrorist attacks they will never be able to prevent the next one," he stated. "This imperialistic worldview which claims to superimpose an ideology and motivation on others is not only misguided it will harm the very efforts necessary to stop those who are undoubtedly planning the next massacres." 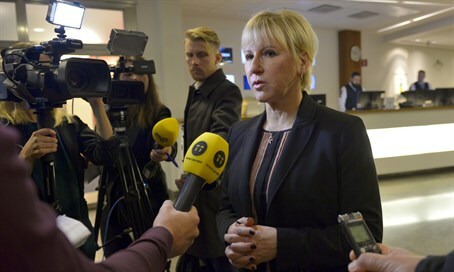 Since Wallstrom's comments were published in Israel Monday, the Swedish government has attempted to play the controversy down, with Sweden's embassy in Israel denying she ever made the link.